A company called Progressive is about to release to the market a set of five new tools for home canners, and I’ve had an early opportunity to try them out. Here’s what I’ve found. 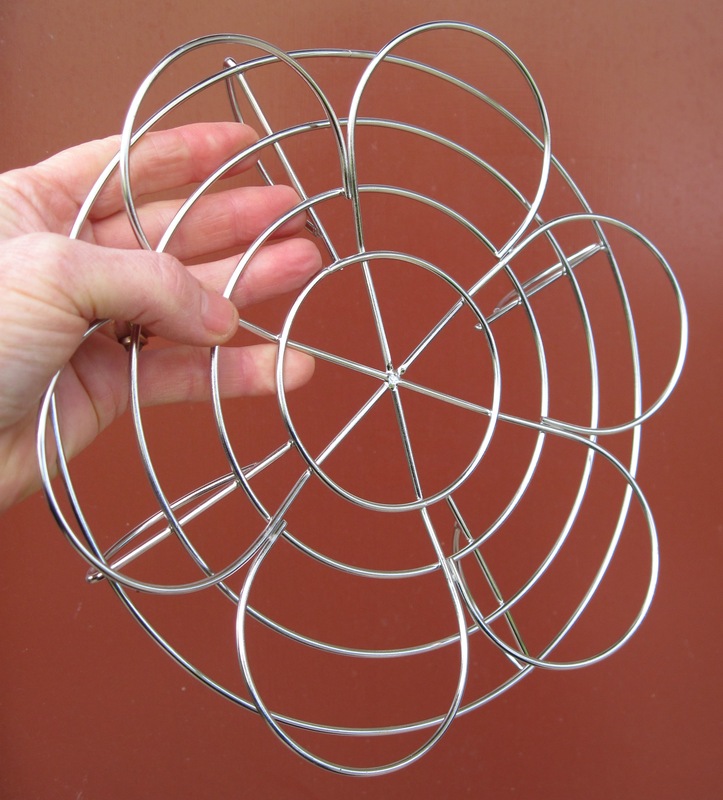 The stainless-steel wire jar rack, 10½ inches in diameter, has petal-like loops that flare upward from the center, to 1/2 inch above the base. The rack holds seven pint or half-pint standard mason jars, narrow- or wide-mouth, more securely than has any other wire rack I’ve used. Here you see the rack in my 16-quart stockpot with jars of various sizes. Flip the rack over, and it will hold four standard quart jars. 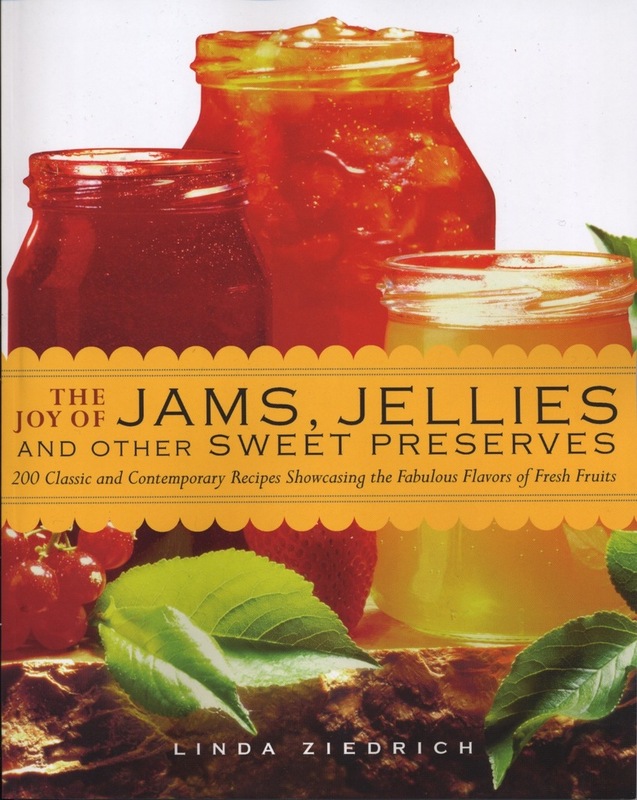 The peculiar shape of the red and white plastic ladle allows you to scoop nearly all of a batch of hot jam quickly into jars instead of having to pour and scrape it from the pot when you’ve given up on your round-bottomed ladle. One scoop fills a half-pint jar. Although the plastic looks as if it would melt in a dishwasher, Progressive says it will stand heat of 400 degrees Fahrenheit. The ladle suffered no harm, in fact, when I used it to stir a pot of hot chili on the stove. The ladle has both a hook for hanging from the side of a pot and a loop for hanging from a rack. 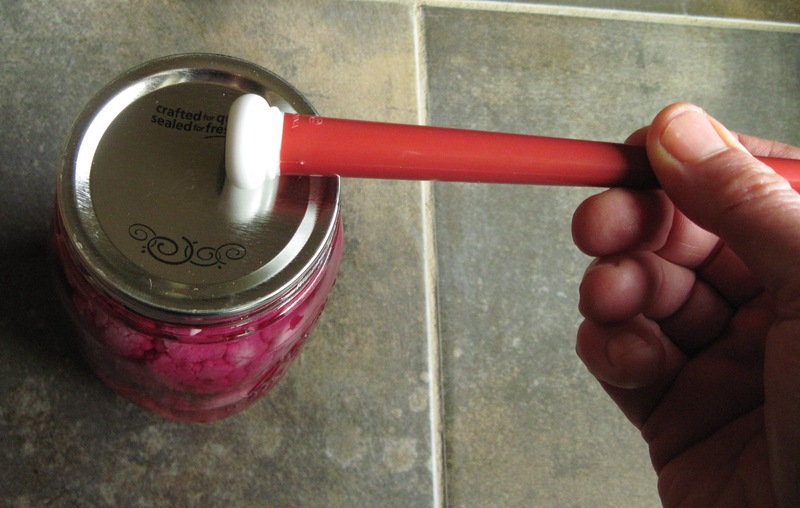 The plastic funnel is made up of two parts, an inner red part that fits into the mouth of a mason jar and an outer white part marked in fractions of an inch for measuring headspace. This works well for liquids, but to see clearly whether vegetable or fruit pieces are floating up into the headspace you’ll still have to look into the top of the jar. 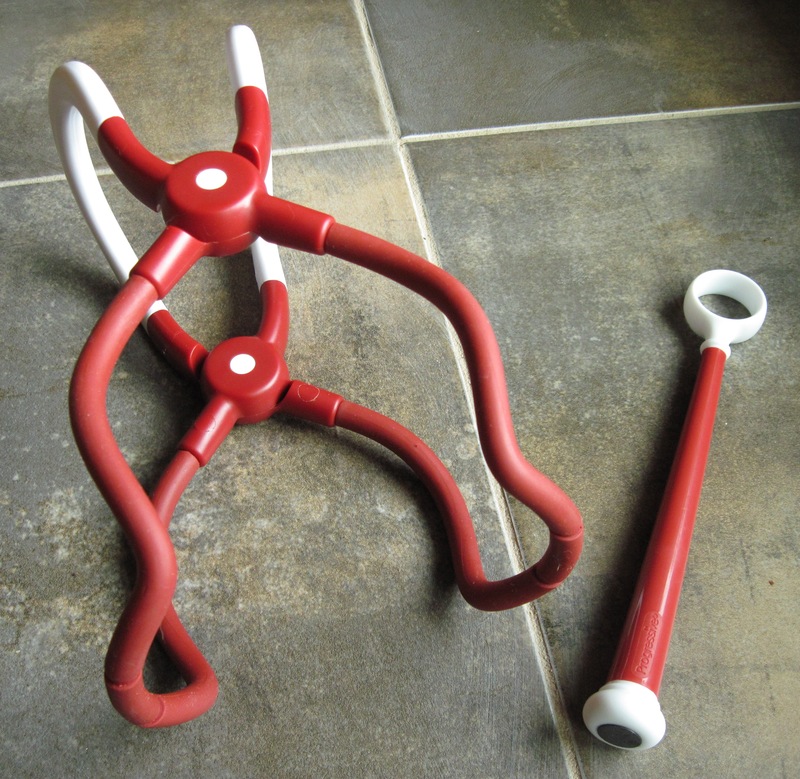 The jar lifter is the only one of these tools that doesn’t strike me as special. Its spring-loaded hinges keep the lifter open until you grasp the top, and this feature is supposed to make the lifter easy to use one-handed. But I’ve never had any trouble using my thirty-some-year-old jar lifter with one hand. I like my old jar lifter better, in fact, because it takes up less room in a drawer. Although I don’t care for the plasticky look of these tools (excepting the stainless rack), I admire their clever designs, which originate in Progressive’s offices in Kent, Washington. But Progressive tools, sadly, are manufactured in China. If only the company would live up to its name by moving the factory to the USA! I’d pay more for American-made canning tools; wouldn’t you? 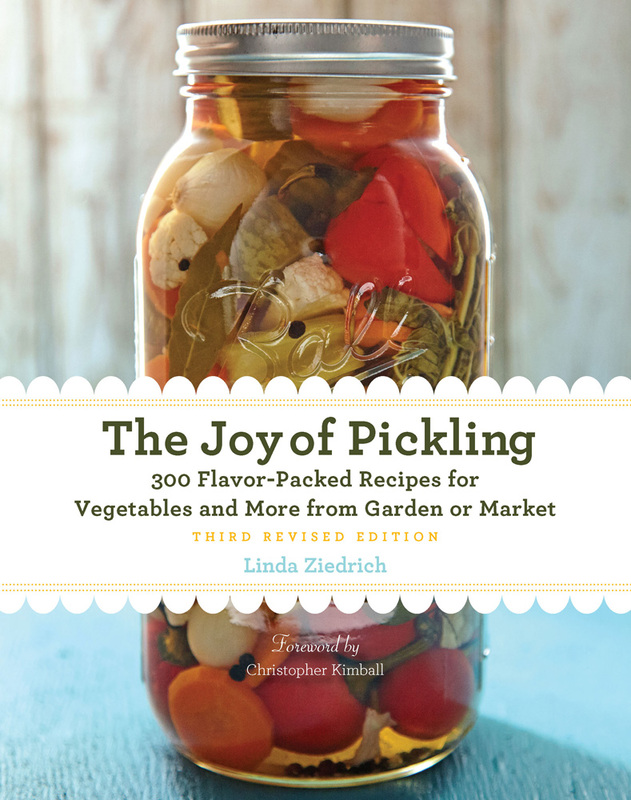 This entry was posted in Pickles, Preserving science and tagged canning, canning rack, food preservation, funnel, jar lifter, ladle, lid lifter, Progressive, tools. Bookmark the permalink. I too am happy to pay more for made in US products, and will not be purchasing anything invovling food that comes from China. Perhaps you can put a bug in the company’s ear? Don’t worry, Terri–they’ll be reading my review and all the comments that follow. I would pay more for American-made canning tools. I agree, too bad they are not American made. I would absolutely love to see a stainless steel version of that ladle. The shape is brilliant. A plastic one though? No thanks. Thanks for your review and thanks for including manufacturing information. These days “where is it made” is my first question before I buy anything. Buying US-made products is the one tangible thing we can all do to help bolster our economy. The canning rack seems like a good design. 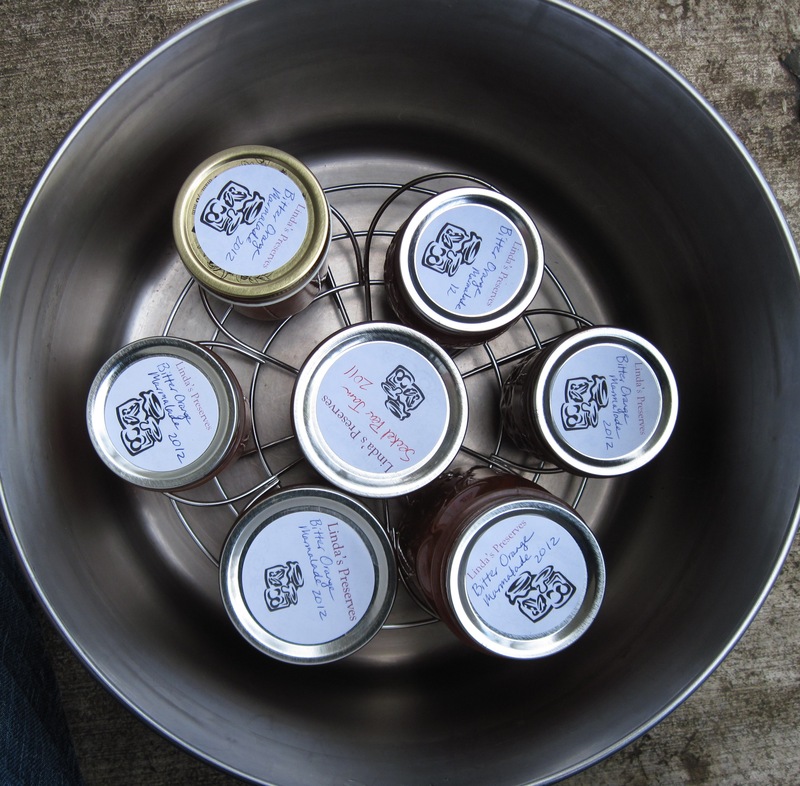 I have the traditional black and white speckled enamel canner and with the accompanying rack could only can quarts. I modified (read cut up) a spare cooling rack to fit over it but even then half-pints are a tad unsteady. I certainly have all the kitchen equipment I _need_ but I’m always interested in something new and fun. Thanks for posting your notes. I would pay more, any time for American made products! Thanks for that perspective, Jam. It leaves me uncomfortable, though, about persistently high U.S. unemployment. I know competent people who would take any manufacturing job, or even any job at all. Nice looking tools; seems like they would be very functional. The ‘made in China’ is an issue with me also. I will pay more for American made! I always ask where something is made or comes from when it comes to food products or something that is used with food. I pay nearly twice as much for certain seafood products to get the ‘America’ or ‘USA’ on the package. We have to get wiser here in our country and demand the USA logo on our products …that they be made here and support our workers. Thanks for all the good tips, recipes and blogging you do. Greatly appreciated! Interesting idea for the funnel to have outer flap marked for head-space, and to sit on counter without contaminating interior flap. Clever. I agree that it should be stainless. I wouldn’t buy for that reason, but also it does look very bulky. If it’s too big for the drawer, one would have to hang it ‘decoratively’ – in which case white plastic definitely doesn’t cut it. It should look cool, or at least of professional culinary calibre. Lastly, I’ve given up on jar lifters in favour of heavy duty silicone gloves. My fav brand is Atlas and they are sold as chemical resistant gloves in upscale cooking and hardware stores ($15). I can put my hand into boiling water for an entire minute, hold hot, wet, slippery, jars securely, haul around hot pots (in lieu of pot holders), and since they fit my small hand, I also have enough manual dexterity to fill jars, wipe jar rims, and lift sealing discs from hot water – so the magnetized lid lifter is also unnecessary. In other words I put ’em on and don’t need to remove for the duration of the jar filling stage. I should buy shares in the company, I’m such a fan!! Betsy, the base of the rack is actually raised 3/4 inch, by curved wire supports. The loops rise another 1/2 inch at the outer edge, but they go around the jars, not under them. Thanks for the remarks on silicone gloves. Although I’ve considered getting a pair, I’ve never thought about using them for canning. Love the post and the tools! I really wish they would make a smaller version of the canning flower. I can no longer water bath on my new stove (found that out right before I shattered the top of it) and so I do a makeshift one. I also like to can in smaller amounts. Making and remaking my lid flower works, but it would be nice to own a well-manufactured and permanent one. Sabrena Wright at Progressive pointed out something that should have been obvious to me: If you turn the canning rack over, it will hold four standard quart jars. I have just edited the post accordingly. Hmmm, now that you mention it, if I look really closely at the canning rack, I see how it is shaped.That is a really cool idea. As far as the made in the USA issue, I have heard on NPR that some companies are now “in-sourcing” their jobs (e.g., bringing the plants back from China, India, etc.). Apparently, a major lock manufacturer is doing this now. So, there is hope for made in the USA canning supplies. Linda, I also got a set of those tools for review and had similar reactions to yours. I don’t love the plastic and I find that they generally feel bulkier than I like. These days, I find that my favorite canning tools are the ones I’ve repurposed from other cooking tasks. I use a stainless steel 1-cup measuring cup as my go-to jar filler and my current favorite canning rack is a silicone trivet. A silicone trivet–what a good idea, Marisa! I would definitely pay more for these if they were made in USA. Perhaps Progressive could use this Chinese inventory for their Wal-Mart version of their product and hire a US factory to make a better version to sell in other stores? Thank you, Linda for your review. I hate the canning rack that comes with the big enameled canners. They are awkward to handle with full jars. There are many jars now that don’t fit the racks. I have a 12″ diameter cooling rack that fits perfectly (a picture is on a post from 9/16/11) and any size or shape jar sits flat without tipping. Additionally, if I flip the rack upside down, I can squeak the quart jars into the canner. I might consider the Progressive one as a replacement if I don’t buy a new canning pot this year to replace my 35+ year old canner that is beginning to show signs of rust. Friends, the URL for Gretchen’s photo of her cake-rack-turned-canning-rack is backyardnotes.wordpress.com/2011/09/16/the-tomato-status-report/. In the same entry, by the way, you’ll see a photo of Yellow Flame tomatoes, which are the same as my Jaune Flamme. Gretchen, you’re quite a photographer! I especially like the close-ups of plants, such as the peony buds and shoots at backyardnotes.wordpress.com/2012/03/14/a-shadow-of-opportunity/. Those rust-prone enameled canners, with their even more rust-prone racks, are a waste of money for anyone who does a lot of canning. It’s wiser, I think, to improvise with stainless stockpots and cake racks (or silicone trivets). interesting post. nice to see companies are jumping in and creating new designs, so there are more to choose from. would like to see more north american made products, not plastic, but how about stainless steel? I have a great funnel from lee valley that i use, but can see the benefits of the two -part funnel. that could be quite handy! how about a bamboo-made ladle the one pictured. it’s quite flexible and can be moulded into almost any shape. Amy, I’d love to see a picture of your bamboo ladle. Where did you get it? Hi Linda, oh I don’t have one. I was suggesting the idea that it would be a smart material to use for companies designing these type of products. I agree with the anti China made sentiment. I always check now to see where it was made and often put it back on the shelf with the made in China tag. I’m another fellow who puts it back on the shelf if it’s made in China. But buying American made is getting easier than it used to be, just takes a little searching. I wish I could write-I’d start a blog about it.